Whole Foods celebrated Hemp History during the week June 3-9. Although I am late in joining the celebration, I love hemp products! From personal care products to food, this amazing, environmentally friendly plant has been in use for thousands of years. Due to weird drug laws, hemp’s use in the US has been limited. Most of the current supply for products comes from Canada. That is changing, as voters recognize the benefits of hemp. The recent passage of Amendment 64 in Colorado, which legalizes the cultivation and recreational use of marijuana throughout the state, is having a major impact on the state’s agricultural sector. But the biggest potential for economic growth may actually come from marijuana’s non-psychoactive cousin hemp, which is right now being planted on U.S. soil for the first time in 60 years, thanks to the initiative’s passage. Hemp Hearts are packed full of protein with 10 grams of plant-based protein per 30 gram serving size. 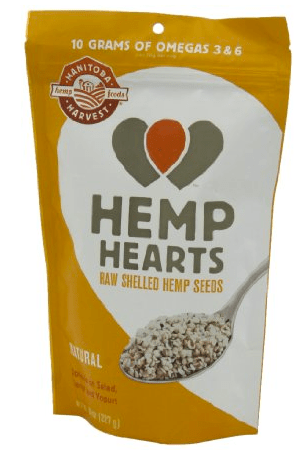 Hemp Hearts are a great way to get an ideal ratio of Omega-6 to Omega-3‘s including the rare EFA known as Gamma-Linolenic Acid (GLA). Testimonials have shown that GLA alone helps with arthritis, joint mobility, eczema, hormonal balance, migraines, menopause in women, healthy cholesterol & blood pressure levels and even weight management. Nutiva’s original award-winning Organic Hemp Protein HI Fiber is our protein powder with the highest fiber content, containing 37% protein, 43% fiber and 10% fat. Hemp Protein HI-Fiber is ideal for people looking to increase their overall fiber consumption while enjoying the fresh flavor of this nutritious superfood. Real, organic hemps seeds, sunflower seeds and raisins; all made with good stuff like whole grain oats. Packed with raisins, sunflower seeds and nutritious hemp seeds! This bar has flaxseeds and is an excellent source of Omega 3’s. This could become a cult classic. And….All our bars now come in the EnviroBox, which is 36% smaller box than a standard 6.2 ounce box. Dr. Bronner’s unscented baby contains no fragrance so is great for people who have allergies or sensitive skin. Of course it is great for babies as well. All oils and essential oils are certified organic to the National Organic Standards Program. Wrapped in 10% hemp-flax / 90% post-consumer recycled paper from Living Tree Paper Co.
Dr. Bronner’s most popular fragrance. The peppermint essential oil tingles the body and clears the mind. Because therapeutically peppermint oil is a mild stimulant it increases vitality and clarity. All oils and essential oils are certified organic to the National Organic Standards Program. Wrapped in 10% hemp-flax / 90% post-consumer recycled paper from Living Tree Paper Co. These products are all truly amazing and thankfully available. The hype from [amazon_link id=”B001GPNLNQ” target=”_blank” ]Reefer Madness[/amazon_link] is ending. It’s a trend that is good for cannabis’ cousin hemp. It’s good for our bodies both in and out!